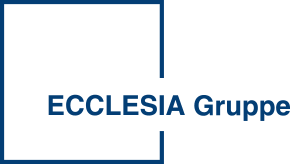 With around 1,650 employees, the Ecclesia Group is one of the leading insurance brokers in Germany and Europe. Around 780 employees work at the head office in Detmold. With its extensive range of services, the Ecclesia Group primarily serves customers from the church, church institutions, social and health care institutions as well as industrial customers. The enterprise is present in Germany in Berlin, Hamburg, Munich, Frankfurt, Cologne, Nuremberg and Leipzig. In addition, the Ecclesia Group is represented in seven other European countries.